I wrote a big long wordy post about my long run last week, but I couldn't hit publish...for lots of reasons, but here is the condensed version. My happy place is when the dew point is under 55. 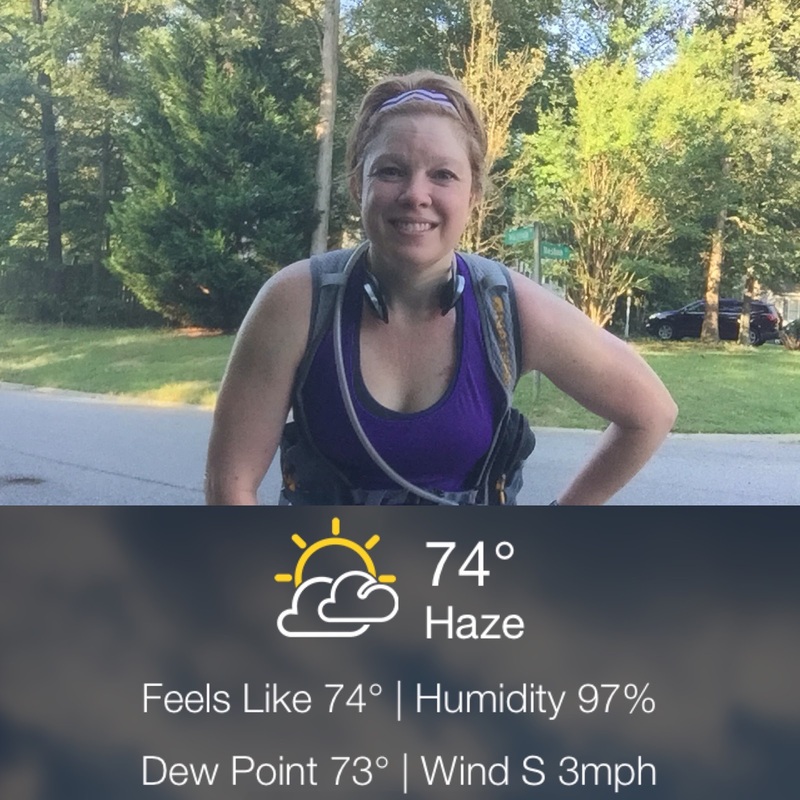 It doesn't matter if there is humidity in the air, it feels manageable. Every point above 55, I feel about 5 lbs. heavier. 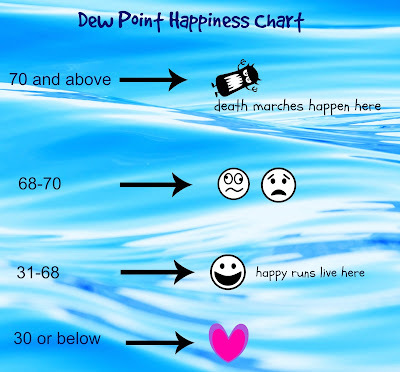 Every point above 70 is like death....for real. Rain-forest, swamp like, muggy conditions. My long run - 73. That is 3 points above death! I went prepared to conquer, sweat, and smile even when it felt the opposite. I took 2 liters of water, and two packs of Mestrength. I was surviving pretty well until the 90 minute mark. Once the sun was strong, I struggled with queasiness. I didn't feel well the last half hour between nausea and foot pain, shade was spotty at best, but I didn't fall apart mentally. I used my intervals, slowed the walk breaks trying to recover, and took my time. At one point, I did contemplate that if I started right at 5 a.m. I may have avoided the most difficult part of the run. My feet do feel like they burn more on the bottom in the heat...maybe it is my imagination...idk...but two hours into the run, my feet were screaming to be done. I had high hopes with easy paced intervals, I would be able to increase the amount of time I can spend on my feet, but that doesn't seem to be the case. I feel like my feet hurt less back in April and May just running the random half marathons I did with no training. I didn't feel well for about an hour after this run, but luckily the effects didn't linger longer than that. I have tried wide sizes, a bigger size, men's even, trying to find something that works with my orthotics and it has been a challenge. I got tired of ordering and returning things, and the search for shoes kind of exhausted me, but I will get back to it soon and see if I can find a new option to revive me. I do like the Reebok's I am running in, they are fantastic for a 5 or 6 mile run. The upper is a good fit and material is soft, but I wish they had a little more sole under them. I keep hoping I will eventually find something that feels just a little more supportive. Basically, I am looking at 9 runs between August and October that need to be at, or over two hours, if I am going to train. Currently that doesn't seem realistic. I haven't completely thrown in the towel yet, but I am trying to make the right decision about how to proceed. Common sense says if I can't run 11 miles comfortably, than what I want and what I am capable of, may be too far apart. I have developed a tender spot on the ball of my left foot and I don't want it to get any worse, so I will cut back for a few weeks and ride it out till I feel better. My heart doesn't deal in common sense only, so I am sure I will try at least one more long run (maybe two) before I completely concede that the marathon distance is going to be out of my reach. 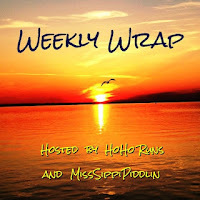 I almost didn't hit publish on this post either, because honestly, it sounds heavier than I hoped, but it is my current journey, and it isn't all smoothly paved, and that is OKAY! I knew coming into this I would have an uphill climb, since my feet aren't 100%. So, maybe it is a bump in the road, and maybe it is the end. I am not really sure, but I am going to stay on the road as long as I can! Any fun weekend plans coming up? Are you working on your long run plan for the weekend already? This past week was a lot of weirdness. I didn't do any push ups, core or weight work until Sunday. I am turning to mush. I really prefer Mon/Wednes as my running days. I did ride my bike Monday morning, a nice easy recovery ride, but it just doesn't hold the same impact for me. I had to ice the feet quite a bit early in the week, but by Thursday they were close to being in their normal state. Tuesday when I ran it was super sticky and hot. I knew when I opened the door, I needed to start preaching to myself, I GET TO run! I get to run! I could still feel my fatigued glutes from hiking and running down the mountain (((which I love))) so my mindset was just get 5 and be done, and I really didn't feel well. I wore my Hoka trail shoes to hike. Hokas are hard for me, I like that bottom of my feet feel SO protected, that works for me, but the model I have are probably just a tick too narrow and even the slightest pressure on my feet anywhere, sides, toes, seems to send my feet spiraling. While the Hoka sole has its advantages, the upper material doesn't really give. They start off feeling great, but as the day progresses and my feet get puffier, the shoes feel a bit restrictive, so I have decided to retire them. I am sticking with Merrell's . My Hokas - that is a lot of sole peeps! Tuesday morning I made the critical error to run in older pair of shoes that have a thicker sole, because my feet were still hurting a bit, again I could feel just a slight pressure on the sides of my feet and I struggled. Hot, sticky, sore feet, and I had to stop for the first time in a veerry long time and just stand still (mile 3) and let my feet calm down. I still got 5 miles done though, I was too far from home to walk. Thursday when I headed out I had my Reebok's on and went very easy. I was feeling kind of stiff all over, I guess from sitting all those hours during the day and sleeping so much! I was sluggish the first mile, and by mile two I dropped the pace even more just trying to hang on. I thought about stopping, I wondered if I should just do loops by house in case things got worse, and then I said "No". Today is the day I get to run! I said it on repeat. I headed toward my sprinkler stops and my first few weren't on - uh oh! Luckily, about mile 3, I spotted one and doused my back and head. I got rolling again, and that was all I needed. I ran strong all the way back home. A good lesson in never give up, because sometimes things can really can flip for the good! After I rested Friday, I felt fine and wanted to tackle a long run, but I am going to post more about my 11 miler in my next post. That crazy run needs its own space. Overall, I feel a little lackluster about last week, I guess because I didn't feel well for so much of it, but looking back, it really wasn't that bad. 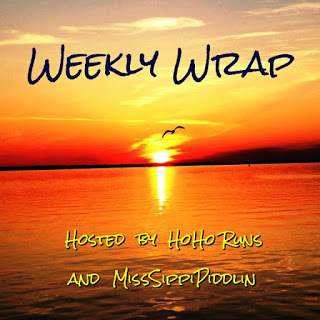 I am glad the weekly wrap makes me think that through. When is the last time you had a good endorphin fix? Had a "bad" run gone good? Do you have a summer mantra?! I get to run! I get to run! I get to run! ****that is mine! The heat waves continues, I am really going to need that mantra this week. I did skip the gym on Sunday because I decided to hike, so no leg work all week! I crammed all my upper body into one session but, honestly I am not that worried about it. I do try to be consistent from week to week, but sometimes you just have to ditch the “schedule” and live. Hiking was great and I don’t regret going a bit. My Honey was sick with a cold, so he just planned to rest, so Sunday at home wouldn’t have been productive for me. I did wonder if sneaking an extra day on my feet would have some consequences, but my feet felt great when I got done. It hurts me not to run on Monday morning, it really does, however being on my feet Saturday and Sunday I knew I should chill for a day. After work, I started feeling like I was getting the cold UGH! I went to bed really early. I woke up Tuesday super early ready to get my 6 mile run done. My head was cloudy feeling, I was drippy and sneezy, and I realized it may be better to focus on 5 miles. My feet started to really hurt close to mile 3, and I actually paused for the first time in a long time and just stood still. I let the burning sensation subside and then I got rolling again. Too far from home to walk, so I just did it. I have been icing my feet on and off since I arrived at work, and they are feeling much better already. I guess all my fun from last week is coming to haunt me a little. down the mountain - awesome, huh!? And maybe I could/should get my tush to the gym more this week, but it probably won't happen! LOL I am not motivated after working 10 hours. Sunday I decided to take the two hour ride up to Humpback Rocks and take a little hike. It was about 94 degrees, but it felt at least 10 degrees cooler the majority of time I was on the trail, the shade going up and down is completely magnificent. Haha, well epic in my mind, because I get super excited about a good climb up! This is my biggest pack - it is heavy with the 3 liter bladder. It is good for me, it makes me stronger! I also drained it dry in less than 3 hours. This is really a popular spot along the Blue Ridge Parkway. I did the main trail, which is the climb up, as soon as I arrived. It was pretty crowded and some sections are really rocky, but no worries, you just have to pause and let people pass every so often. The pause is a nice break. There are a few fairly steep areas, that will get your heart pumping. It is just shy of a mile to the summit, but it takes about 30 minutes. The summit was covered in people. I took a break for about 10 minutes, soaked in the beauty, then headed to the 3 mile loop down the mountain. This section was a very pleasant surprise! Some sections were smooth enough to run. I wasn't very fast with my mac daddy pack on, but I held the strap (it bounces) and ran. It was invigorating! This section of trail was extremely quiet and I enjoyed the solitude. that were smooth like this. I would run until I came to sections like this, full of rocks and walk. After I ran/hiked this section, I felt great. I decided to go up to the summit one more time before I had to drive home. My second trip up was great, it was a lot less crowded. It seemed clearer out, and I lingered a little longer before I headed back down. I headed back the way I came up, and that steep rocky trail is a little tough on the quads, but I gave it a shot and tried to run a little. I did pause to watch this little gal eat, it was strange she completely oblivious to the fact that I was there. There is a loop down the mountain you can take that is eight miles, so next trip I plan to give it a try. I am hoping it has some sections that are okay to run. My one big snafu of the day?! I forgot to take a towel to put on my car seat for the drive home. Womp...womp...I was a sweaty mess. I did hit a rest room and rinse off the best I could. I laughed when I arrived home, I had turned my seat-belt white from all the salt that came off me. Ewwww! My clothes were so gross, I threw them in the washing machine the second I took them off. I was pretty sure they would have disintegrated if I let them sit in the hamper. Humpback Rock has an elevation of about 3,000 ft. The peaks in Blue Ridge aren't huge in my area of VA, but they sure are beautiful. Thanks for reading and sharing my journey. Tell me where you last hiked or ran a trail! ...and yet this past Saturday kicked my tush! Run buddy came out with me, and it was great to talk and catch up, but trying to push those miles a little bit really challenged me. I hoped since my running has been more consistent week to week, I might be able to keep up with her. However, I was more tired, more hungry, more sore, and my feet were mmmph, even though I was grateful for the company. We have not seen each other or run together since May 18th. Run buddy couldn't make her training team this week, so she came with me. She is training for the Richmond marathon, so we probably won't see each other much until after the November race. I am just hoping I can run the race, I know she will make it. Robyn (co-worker) actually emailed the organizers of the training team to see if they had a Galloway team for me, and they do not have a designated one, but said some people use intervals. I decided since my situation is so chancy/dicey I didn't want to spend $200 for the team and end up running alone. Look at the heart rate zones differences in my "identical nines"
Last week I was picking it up at the end. I am little bummed I struggled so much, I was hoping I would feel a little stronger by now. I guess this was a good lesson for me. I have felt a bit worried (motivation wise) thinking about the really long runs all alone, and I am a bit sad I have no one to run with anymore, but if I try to push myself I don't think I will be able to handle much more distance. I was kind of embarrassed after I posted this! but yes I did, EAT ALL this after my buddy run. I was SO famished feeling, even though I drank my premier protein as soon as I came in the door. I couldn't wait to get out of the shower and eat! I didn't even eat after my solo run, I just wasn't hungry. I ate about two hours later. Weird....huh? The same timed run felt like night and day. I learned there is something to this "easy feel running" I have been trying to embrace, and honestly maybe that is all I can handle right now. It has been so long since I pushed myself, it felt really strenuous. *I learned keeping my heart rate down may be the key for me. I really love spending time talking and running (I miss it), but I need to stick with my unhurried pace and take it one week at a time. So, that is my little adventure and lesson learned from this week. Heart rate zones? Who knew??? Did you know HR's can make you feel so different? Do you ever get lonely on long runs? My first ever Thinking out Loud post! Reading about Hanson’s training method, and several other plans, had me tossing ideas and numbers around a lot! I have to confess, some of these were shockers when I think about how I have trained and did daily runs over the years. Challenge yourself to do a mile or 5K test and really wrap your mind around what it says. It is interesting! Use this other calculator from McMillan Running that helps you figure out paces for different work outs. I used this one from Runners World. The times really surprised me! Never. in. my. wildest. dreams. Just because I CAN, doesn't mean I SHOULD. Preaching to myself here! I basically used the Jeff Galloway Magic Mile strategy for this test. Warm up, run each quarter as evenly paced as you are able and push yourself, but not to the puking point. Like I said I am getting closer to living in those pace ranges now, but seriously, I typically did my all runs in a range that was much tighter. I lived off perceived effort. What feels like effort in summer, always changes dramatically in winter for me. Jeff Galloway uses this formula to arrive at paces. It is all very interesting to take a look at! Oh, and Jeff (smart man) says expect to be slower when it is above 60 degrees. I don't know any lucky people who have even felt 60 degrees lately LOL but we should all expect to hit some snags in the heat, right. The times really vary from from method to method, but are close. I have been playing with pace calculators non-stop, for real...so nerdy. Have you crunched your numbers recently? Do you like perceived effort or checking your pace? I’ll be honest. When I first decided I was going to try to run, I could barely make it two miles without walking, and it wasn’t until I could run a 5K without pausing, I felt like a runner. 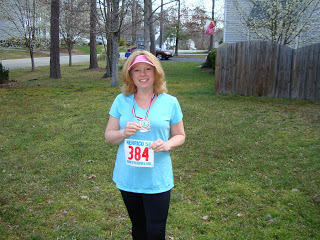 Look a real 5K runner! 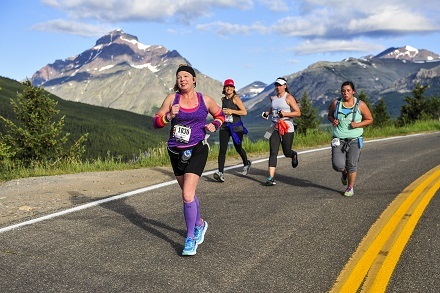 So when I really stated to work on four miles, then five, etc… I refused to stop unless I was having a near death experience because I felt like a failure if I stopped. 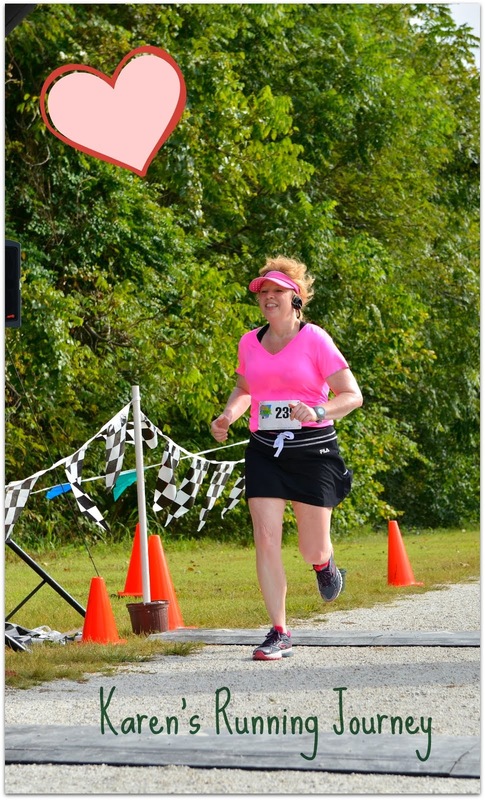 Then, after I ran a few races, I noticed people actually walked through water stops, some just randomly walked a few seconds, and I began to realize I may just be a tick too crazy about this walking thing. True story... It always bothered me during my first half marathon, I had to stop and use the port of potty. It was lack of experience and I drank too much before the race, but I didn’t know any better, I was worried about keeling over in the heat. I lost about 90 seconds stopping at the P-O-P and it made me crazy I had lost time due to a break. Finally a year later, I ran a half without a pause and I felt vindicated. These days, my mindset is so different, I laugh when I look back. The first summer I ran, I was crazy. I would want to run seven miles, so I would make myself run to halfway point. I would stop my Garmin (LOL) and walk about 5 minutes, steal some drinks from sprinklers, then start a new run. I would rarely even say I “ran” seven miles because I didn’t do it all at once. 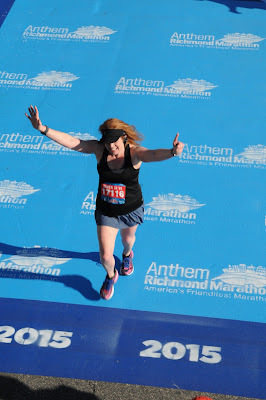 Dreaming about 26.2 started a short time after I ran my first half, but I didn’t believe I was capable. 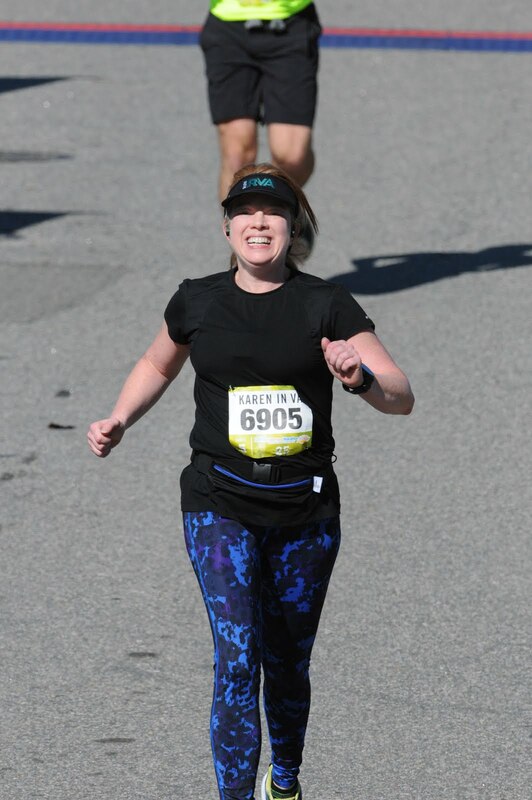 After I started reading a lot of blogs, and read about people’s brutal first marathon experience, I got really scared and decided I needed to run a few years before I could even think about trying. I wish I wouldn’t have done that! My heart finally decided I could do it, but my health took a dip. *Seize the moment* tough lesson learned. To be honest, I don’t like to even think about long distances right now. I really want to let them go…but before I close that chapter completely, I have a few things I want to accomplish. A marathon is the top of the list. My ideas about what a marathon may look like for me now have dramatically changed; intervals are always part of the mix, but even with lots of walking, that many hours may not be reasonable for me… I am still playing around, trying to see if there is way to do some longer runs without causing more injury. What I really want is to check off my list, and then say I am not racing anymore on my own terms, not be taken out due to injury, health, etc. I want my memories when I fade away into the sunset. The truth is I have been very content doing one 5 and 6 miler, and some kind of interval adventure, and calling it a week. My pain is manageable, I don’t see new damage, and that is what I want, to preserve what I have. 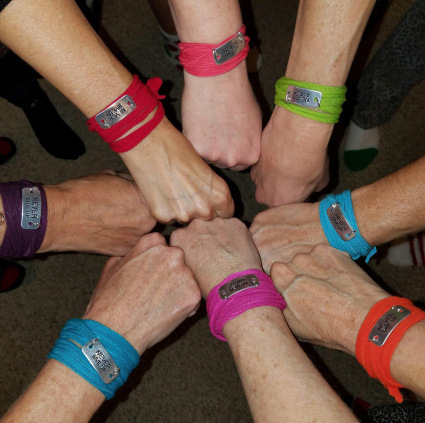 Will I miss half marathons? Yes!! I already do. It is becoming apparent to me that the American FamilyFitness Half was my last time to line up and run a race with barely a pause. I will be forever grateful that I had those moments, the perfect weather, and the perfect nerve to push myself that day. I replay it in my mind often… seriously, just the best day. I am not saying I will never run another half in my life, but just running them for fun is a lot different. Will I still be a runner? Well sure, maybe not a runner with big goals anymore, but I will still feel like I have a part in the community. Trust me there is a small part of me that says…at my age, preserve, what for? Maybe I should just go all out, but I don’t enjoy pain either. You know I always enjoying hearing your thoughts! Do you ever think the day your running may change? Thoughts about goals, motivation, the need to have a reason to train and run, when to call it quits, personal contentment. Just Laying It Out There!